B. Mayer. Radiative transfer in the cloudy atmosphere. European Physical Journal Conferences., 1:75-99, 2009. B. Mayer, S.W. Hoch, and C.D. Whiteman. Validating the MYSTIC three-dimensional radiative transfer model with observations from the complex topography of Arizona's Meteor Crater. Atmos. Chem. Phys., 10:8685-8696, 2010. C. Emde, R. Buras, B. Mayer, and M. Blumthaler. The impact of aerosols on polarized sky radiance: model development, validation, and applications. Atmos. Chem. Phys., 10, 383-396, 2010. R. Buras and B. Mayer. Efficient unbiased variance reduction techniques for Monte Carlo simulations of radiative transfer in cloudy atmospheres: the solution. J. Quant. Spectrosc. Radiat. Transfer, 112, 434-447, 2011. C. Emde, R. Buras and B. Mayer. ALIS: An efficient method to compute high spectral resolution polarized solar radiances using the Monte Carlo approach J. Quant. Spectrosc. Radiat. Transfer, 112, 1622-1631, 2011. Homogeneous plane-parallel clouds may not exist in nature but they are the only ones for which we know how to solve the radiative transfer in a small amount of computer time. A.B. Davis et al., EOS, 80, 622-624, 1999. Having that in mind, MYSTIC (Monte Carlo code for the physically correct tracing of photons in cloudy atmospheres) has been developed since 1997 to investigate all kinds of three-dimensional effects, including clouds, topography, and inhomogeneous surface albedo [Mayer, 1999], [Mayer, 2000], [Kylling et al., 2000]. MYSTIC participated in both phases of the Intercomparison of Three-dimensional Radiation Codes (I3RC) where it proved to be a versatile and accurate tool to investigate a variety of exciting questions. Some examples below demonstrate the capabilities of MYSTIC. 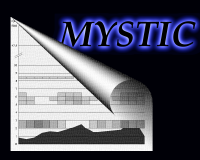 MYSTIC is a Monte Carlo code which traces photons on their individual random paths through the atmosphere. As such, every single scattering, absorption, and reflection is treated indiviudally. Given that the single-scattering processes are known correctly, the radiation field is calculated exactly, without needing any simplifying assumptions. To get an idea how it works, have a look here! Figure 1: Cumulus cloud field; this example has been simulated with Bjorn Stevens' LES model and served as one of the cases in the Intercomparison of Three-dimensional Radiation Codes (I3RC). Figure 2: MYSTIC simulation of the nadir radiance at top of atmosphere for the cloud field from Figure 1. The cloud was parameterized on a grid with 192 x 192 x 40 cells, the surface albedo was defined on a 600 x 600 pixels grid, and the resolution of the image is 192 x 192 pixels. With an image size of 6.4 x 6.4 km2 this corresponds to a resolution of 35 m. The wavelength is 670 nm, where the main influence is clouds. Scattering and absorption by molecules and aerosols is generally low here. 750,000,000 photons were traced to produce this image. This image shows what a nadir-viewing satellite instrument would measure, or what an observer from an airplane would see when looking straight down. The sun in this example is shining from the left, under a solar zenith angle of 30°. The cloud shadows on the surface are obvious. The sunlit left side of the clouds appears bright, while the right sides are shaded. The surface is a typical example of German farmland with small fields and pastures. While the above image is most interesting for the remote sensing community (and for people who use airplanes a lot), climate researchers and experimentalists might be more interested in radiation fluxes at the surface and at top of the atmosphere. The following image shows the wavelength-integrated solar flux (0.2µm - 4µm) at the Earth's surface, again for the cloud field from Figure 1. Figure 3: Integrated solar flux (0.2µm - 4µm) at the Earth's surface for the cloud field shown in Figure 1. The sun is again shining from the left, under a solar zenith angle of 30°. The right image shows a cross section along the dotted line. Figure 4: Integrated solar flux (0.2µm - 4µm) at the Earth's surface. Comparison between MYSTIC simulation and independent pixel approximation. The 3D shadows do not appear below the clouds, but of course offset into the direction of the direct solar beam. The 3D radiation field outside the cloud shadows is enhanced compared to the one-dimensional approximation. The 3D flux inside the cloud shadows is considerably enhanced compared to the independent pixel approximation by more than a factor of 2. This is caused by sidewards scattering of radiation under the cloud. These effects of course depend on cloud type and geometry, on the solar zenith and azimuth, and on the background atmospheric conditions. In summary, it is an open question under which circumstances one-dimensional approximations are applicable. The answer to this question depends strongly on the application. As an example, for overcast sky, the independent pixel approximation seems to give reasonable results for the area-averaged (over tens of kilometers) transmittance and reflectance. For broken clouds, on the other hand, large differences may occur. If spatially resolved quanties are envisaged (on the scale of a kilometer and below) three-dimensional methods are certainly required. Large parts of the land surface are not flat, but vertically structured. Whether three-dimensional methods are required depends mainly on the slope of the area under investigation. The structure of the surface has an influence on remote sensing results, but is equally important for surface observations. Many observation sites are located on mountain tops to minimize the influence of the polluted boundary layer on the measurements. Prominent examples are Mauna Loa Observatory (Hawaii), Jungfraujoch Observatory (Switzerland), and Zugspitze (Germany). 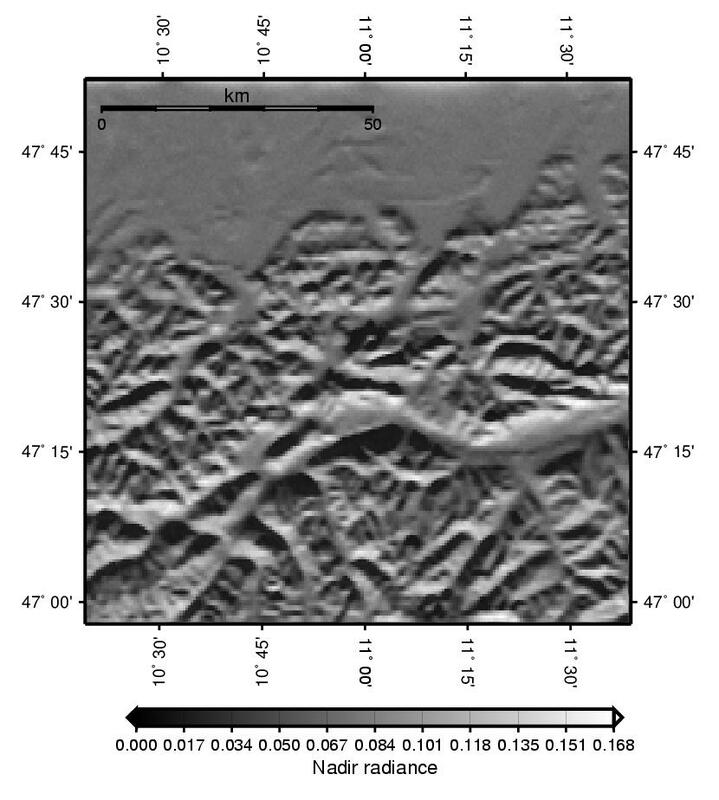 Another example is the observation site at Tromsoe, Norway which is located close to the coast line that is formed by a complex system of fjords [Kylling et al., 2000]. The interpretation of radiation measurements at such sites requires a careful consideration of topographic effects, especially when clouds below the station additionally enhance the reflecivity of the atmosphere below. For some new applications have a look at the simulations for Schneefernerhaus, the Metcrax experiment, or for Weissfluhjoch next to Davos. These calcultions are based on a high-resolution topography and illustrate the new backward photon tracing capabilities of MYSTIC. 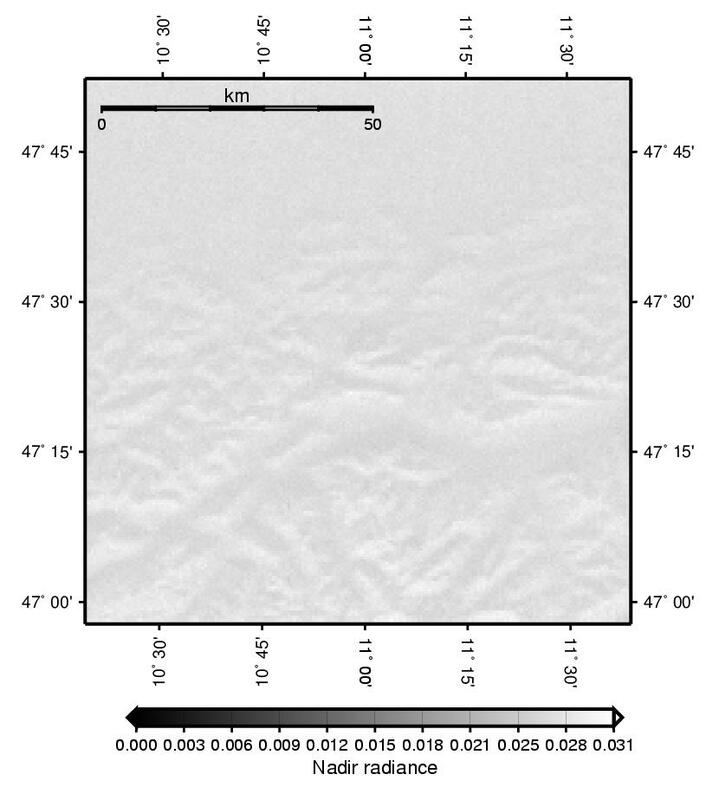 Figure 5: MYSTIC simulation of the nadir radiance over a 100 x 100 km2 area centered around Zugspitze, Germany. The sun is in the South, under a solar zenith angle of 70°. The wavelength is 600 nm, and the simulation was done for clean, aerosol-free conditions. The whole area was assumed to be covered with fresh snow (albedo 0.8). Figure 6: Same as Figure 5, but at 320 nm and aerosol loaded conditions. Here, the radiance at top of the atmosphere is no longer directly transmitted from the surface, but smoothed considerably by multiple scattering in the atmosphere.